If you want your product, service or business to win in a competitive market, your positioning strategy had better be more than a soft definition of your target customer and a somewhat generic benefit they get when buying from you. Consider the fact that while you’re trying to get customers interested in your product or service, your competitor or competitors are trying to do the same thing. Worst of all, while they’re trying to convince customers to use their product they are also trying to convince them to not use yours. So the negative effects of a soft positioning strategy are compounded because your product doesn’t exist in a world where the opposite of engagement is mediocrity. In the competitive markets where most of us compete, the opposite of engagement is obscurity. The positioning you define for your brand creates a scenario made of the interaction of three entities, your product or service, target customers, and your competitors. The strength of your positioning will determine the competitive quadrant you exist in. Let’s take a quick look at how these quadrants are defined. (1) Your competitor’s positioning connects with your customers and resolves their needs/problems/desires better than your product or service. In this scenario your product is seen as inferior and your growth stagnates or declines. This is the “Losing Zone”. 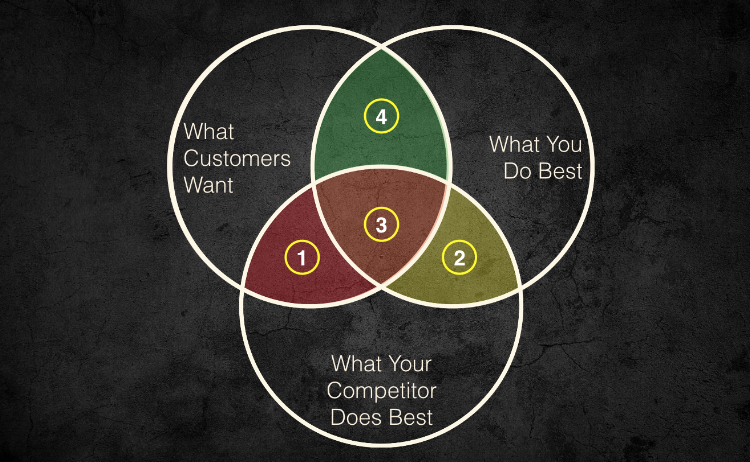 (2) In this second quadrant your positioning doesn’t connect with customers in any significant way. This scenario occurs when marketers generalize their target in an attempt to broaden their market potential. The result is most often a misalignment between what customers are looking for in a product or service and what they believe you can deliver. If you find yourself in this area, your business is stagnant at best and may decline rapidly if competitors make even a slight connection to target customers. This is the “Irrelevant Zone”. (3) This scenario is not as dire as the two listed above. In this case you have created a positioning that relates to your target customer, at least somewhat, and so has your competitor. While your positioning relates to the target customer, it doesn’t connect deeply or create sufficient differentiation to provide a strong competitive advantage. When this scenario develops you fight tooth and nail with your competitor for every customer. You spend heavily on promotion with a very low ROI and market share barely moves; any gains are extremely hard fought and expensive. This is the “Battle Zone”. (4) The last quadrant is the landing zone for engaging and differentiating positioning. When you’ve created a positioning strategy that has a clearly defined target customer with a need, problem, or desire that is uniquely satisfied by your product, service, or company you end up here. In this quadrant you create significant differentiation and customer engagement; sales grow, market share grows, promotional efficiency increases, and ROI multiplies. In this quadrant you develop market leadership even if you are not the largest player. A strong, differentiating positioning strategy is critical to reaching this area known as the “Winning Zone”. As you assess your products, services, and company, consider where you fall in these four quadrants and what it will take to get into the “Winning Zone”. If it’s not clear how to get there, send me an email (click here) and we can set up a short call to discuss your situation. What do you have to lose, the email and call are free, but doing the same thing you have been may cost you everything. What Is Chipotle Thinking ...?